Current events have been pretty dark lately. The new abortion law in New York, growing concerns over North Korea and Iran, and the global refugee crisis – to mention just a few. How do we as followers of Jesus hang on to hope? Look to the Rock. “Look to the rock from which you were cut and to the quarry from which you were hewn” (Isaiah 51:1b). Now you might be wondering, what on earth does that mean? 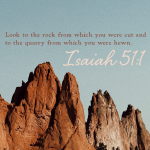 Isaiah is challenging Israel to return to the Lord – He is our rock. The Psalmist David also refers to God as his rock in Psalm 18:2. What a great word picture Isaiah and David paint for us by describing God as our rock. When I think of a rock, I imagine strength. A rock is solid and strong. In the New Testament Jesus is also described as our rock. He is our rock-solid foundation. Steve and I like to wander around Garden of the Gods in Colorado Springs. The big red boulders that make up the national park are majestic. Our grandsons love to climb and hide within the natural fortresses created by them. In the moments when you need hope, pause and praise Jesus Christ for being your rock. Imagine yourself hiding in the clef of the rock, sheltered from the storms of life. Listen to the Lord. “Listen to me”(Isaiah 51:1, 4). We are constantle bombarded with all the noise in our world. News channels on TV, the opinions of others on Facebook, email, Instagram, Snapchat, and Twitter. All that information can be exhausting. I believe it can also make us cynical. Be informed, but don’t become addicted to the news. Create the space for quiet and listening to God’s voice. Spend time in His Word. Listen for the still small whisper of His voice. Turn off Netflix and turn on worship music. It’s amazing how what we listen to affects our attitudes. When I sense heaviness in my spirit, I will often turn on worship music and go room by room through my house praising God. As I allow the music to prompt my praise, my attitude shifts. I want my home to be a place filled with joy, peace, and hope. Lift your eyes to drink on the beauty of creation. “Lift up your eyes to the heavens, look at the earth beneath” (Isaiah 51:6). In the passage surrounding this verse, Isaiah is saying that the heaven and the earth will someday vanish, but the salvation of the Lord will go on eternally. But even though earthly beauty will pass away, I believe that our souls were designed to enjoy the beauty of creation while we are here. The Bible is clear that creation reflects the beauty of its Creator (Psalm 19:1, Psalm 95:4-5, Romans 1:20). May I gently challenge you, friend? When you need hope this week, go outside and take a walk. Or if it’s too cold where you live, take a drive, or simply look out your window. Look for the splendor all around you. Take a moment and glance up at the stars at night. Drink in the beauty of the sunrise in the morning and the sunset tonight. Notice the patterns created by the clouds, or buy some bright flowers for your house. All of God’s creation magnifies the Artist who imagined it in the first place. As you enjoy its beauty, worship the Creator—and I believe hope will rise in your heart. Steve and I will be in Tucson this week at an event we are hosting for Reach Beyond. Praise God that the last two weeks of travel have gone extremely well. We had a great time with friends of Reach Beyond in Florida. My time at the CPE went very well. What a joy! Please pray for our event in Tucson, Bob Goff will be the guest speaker and different ministries of Reach Beyond will be presented. Pray that all those who come will be ministered to and encouraged.